I was in Thorold a few weekends ago, and it happened to be wine making time! My parents had already picked their grapes the week before (about 12 bushels, I think). Because their grapes are mostly white grapes, they bought a few cases of California red grapes to make the wine a red colour. What they do is warm the grapes up in a huge cauldron outside – just enough so that it will speed the fermentation. Then they crush them using a machine (no, they don’t use their feet!). Finally, they put the crushed grapes into large tubs and let them ferment for a week or so. Making Wine 1 from Reid on Vimeo. A view of the wine pouring out of the press. We haven’t pressed it yet, it’s just the juice from the crushed grapes. You can also see my mother preparing the sugar that’s to be added. She’ll add some of the wine and warm it up on the stove to melt the sugar. During the movie, I ask my mother what she does with the sugar (she says she’ll add it to the wine barrel), and she’s surprised I don’t remember all this. And I tell her that I was never around, all I remember was my grandfather giving me a ride on the metal bar over the press. (You’ll see that bar in a later video). Making Wine 3 from Reid on Vimeo. Making Wine 4 from Reid on Vimeo. My dad starts to add wood blocks to the press. You only see a few in this video, but he will add 5 or 6 layers of blocks. Making Wine 7 from Reid on Vimeo. All the blocks of wood have been added, and the metal bars have been attached to the “screw” portion of the press. I distinctly remember getting a ride on those bars as a small child, but they would have pressed the grapes way down before I could fit. Making Wine 9 from Reid on Vimeo. They filled up the barrel, and a demijohn. They’d need another demijohn as they continued to press over the day. I had to leave before the end of the day, unfortunately. The wine will continue to ferment in the barrel and demijohns. After 40 days, it’ll be ready for drinking (although, they’ll probably wait longer). Luisa: So, I don’t fit any more to sit up there. How could I have ever fit up there? Mum: How am I supposed to know? Luisa: …With those cords, I would have hung myself. Mum: Now he’s going on his own. See? See how it pours there? Dad: We’re going to need the big demijohn, and it won’t be enough, either. Luisa: How does it [the wood] get sent down? Luisa: How is it that it sends that [wood] down? Mum: This will all end up below, only this much will be left out. Then we’ve got to flip it. Mum: You flip the grapes and then you put it all back and..
Luisa: And how much will come out? Luisa: A gallon, ok, but.. a couple of glasses…? Luisa: Oh, fine and clear. Finally. Then, can you drink already now? Luisa: Why? What’ll it do to you? Luisa: And when will you drink that now? Mum: Saint Martino’s? When is Saint Martino’s? Luisa: Now I’ll turn … now I’ll turn. I exaggerate. But when we put up the first pictures of the cottage, and our good friend Walter saw them, he sent us email. He was very concerned about the supports. We were able to reassure him – my brother is a civil engineer, like him, and he knew about the problem and in fact it was one of the first things he fixed. The picture below is the before picture. If you look closely, you can see one of the wood beams getting very close to the edge of the support. He also decided to level the cottage last year. Since he wanted to add some windows and replace patio doors, it needed to be leveled. 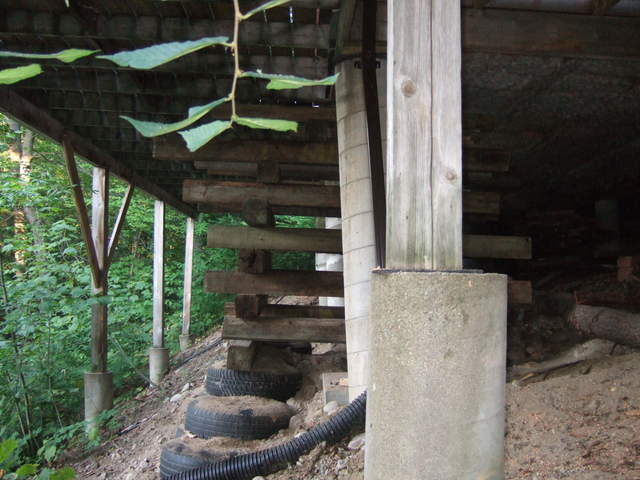 So, a little at a time, he shored up each post and made the cottage level. Then this year, after he replaced the patio doors, he was under the cottage and realized that the whole cottage was leaning out further. 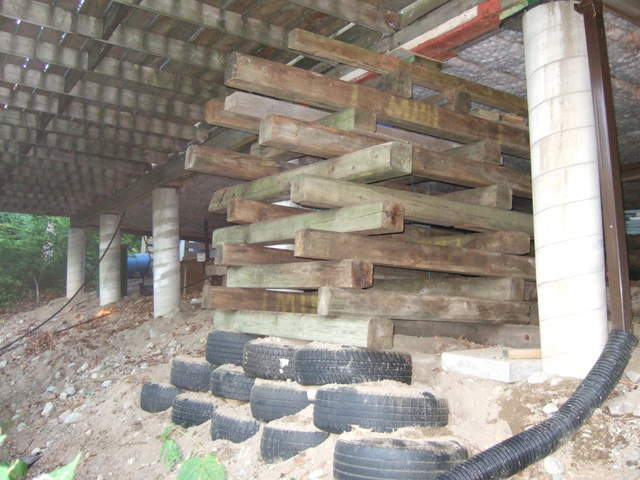 He figured that the load on the supports had changed, and as a result, the “piers” it was resting on started to lean out. He hadn’t thought of this happening, and I think he was a little upset because it diverted him from his other plans. He now had to put everything on hold until he could figure out what to do. At some point I realized he had stopped talking about it, and so I asked him how that was going. And he said, “Oh, I’ve got that worked out”. And he sent me these pictures. Jeez. He’s been calling this one the “Leaning Pier of Tony”. This one looked pretty frightening to me. He says this will hold the cottage steady through the winter and heavy snows, and he’ll have to dig out the piers and re-set them vertically next year. Any of you civil engineers out there have some advice? ?